Almost two years ago, a large contingent of The 100's fandom swiftly turned on the show and its creators after the sudden death of Lexa, one of its popular queer characters. For many, Lexa’s death was a shocking twist of events that betrayed the show and spat in the face of its fandom. As the relationship between Clarke (Eliza Taylor) and Lexa (Alycia Debnam-Carey) developed over The 100's early seasons, the show developed a loyal fanbase who responded strongly to the depiction of a healthy, loving queer relationship between two women. But then seemingly out of nowhere, just as Clarke and Lexa finally consummated their relationship in The 100's third season on the CW, Lexa was suddenly killed off. It meant that Clexa became the latest in a long line of fictional lesbian relationships to end in unnecessary tragedy. Fans revolted, The 100's ratings briefly dropped, the creative team spoke out about the whole ordeal—it was a mess. But, with that all in the past, a group of diehard Clexa fans are setting out to give the rest of the fandom the Clarke and Lexa-centric story they’ve always wanted, with Lightning Only Strikes Once, a new comic book adapted from a piece of fan fiction by the same name. 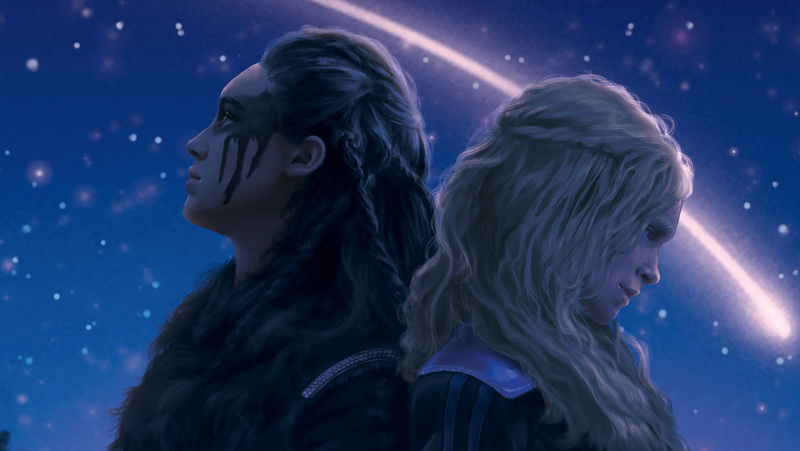 Written by Fiona Dean, illustrated by Alaïs Legrand, and adapted by Derrick Crow, Lightning Only Strikes Once imagines a world in which Clarke and Lexa are able to travel back through time to a point just before the events that begin The 100's first season. With their knowledge of the future, Clarke and Lexa set out to change the course of history while re-experiencing a number of key moments from The 100 that fans will recognize from the show. Certain moments will play out similar to how Clarke and Lexa remember them, but others, like Lexa’s death, are bound to change based on how the heroes change the past. Lightning Only Strikes Once has already blown past its initial crowdfunding goal of $20,000 and is on track to begin, ahem, shipping out the first volume of stories later this spring. According to the book’s creative team, a portion of the proceeds are going back to Koh Tao International Primary, an elementary school in Thailand actress Eliza Taylor helped build. Though it’s a work of fan fiction, Lightning Only Strikes Once could very well end up being the perfect demonstration of how The 100 could have ultimately ended up handling Clarke and Lexa better on the actual show.